A bribe is a charm in the sight of its owner; wherever he turns, he prospers (Proverbs 17:8). A gift in secret subdues anger, and a bribe in the bosom, strong wrath (Proverbs 21:14). Do not take my soul away along with sinners . . . whose right hand is full of bribes (Psalm 26:9-10). A wicked man receives a bribe from the bosom to pervert the ways of justice (Proverbs 17:23). His [Samuel’s] sons, however, did not walk in his ways, but . . . took bribes and perverted justice (1 Samuel 8:3). Your [Israel’s] rulers are rebels, and companions of thieves; every one loves a bribe . . . (Isaiah 1:23). Her [Israel] leaders pronounce judgment for a bribe, her priests instruct for a price, and her prophets divine for money (Micah 3:11). Concerning evil, both hands do it well. The prince asks, also the judge, for a bribe . . . (Micah 7:3).
. . . some of the guard came into the city and reported to the chief priests all that happened. And when they had assembled with the elders and counseled together, they gave a large sum of money to the soldiers, and said, “You are to say, ‘His disciples came by night and stole Him away while we were asleep . 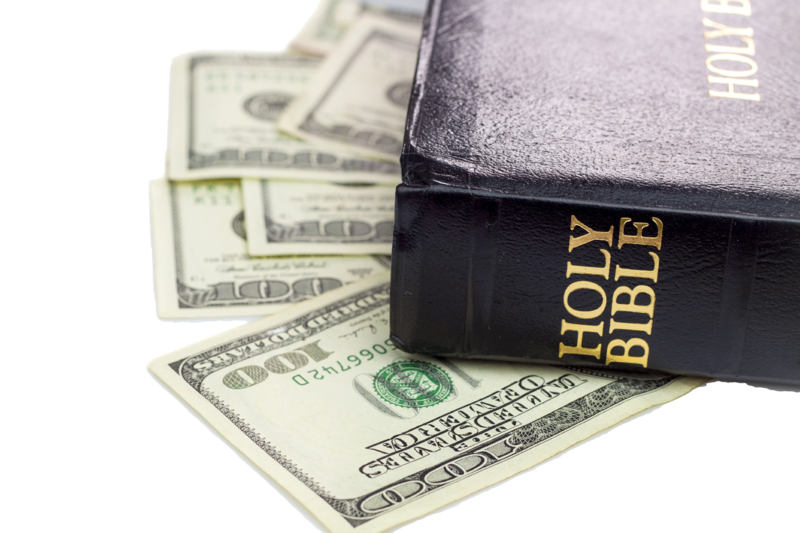 . . they took the money and did as they had been instructed; and this story was widely spread among the Jews, and is to this day (Matthew 28:11-15). “Go away for the present, and when I [Felix] find time, I will summon you.” At the same time too, he was hoping that money would be given him by Paul; therefore, he also used to send for him quite often and converse with him (Acts 24:25-26). You shall not take a bribe, for a bribe blinds the clear-sighted and subverts the cause of the just (Exodus 23:8). You shall not distort justice; you shall not be partial, and you shall not take a bribe, for a bribe blinds the eyes of the wise and perverts the words of the righteous (Deuteronomy 16:19).
. . . a bribe corrupts the heart (Ecclesiastes 7:7). He [king Jehoshaphat] said to the judges, “Consider what you are doing, for you do not judge for man but for the Lord who is with you when you render judgment. Now then let the fear of the Lord be upon you; be very careful what you do, for the Lord our God will have no part in unrighteousness, or partiality, or the taking of a bribe (2 Chronicles 19:7). The king gives stability to the land by justice, but a man who takes bribes overthrows it (Proverbs 29:4). “Here I [Samuel] am; bear witness against me before the Lord and His anointed . . . from whose hand have I taken a bribe to blind my eyes with it? I will restore it to you.” And they said, “You have not defrauded us, or oppressed us, or taken anything from any man’s hand.” And he said to them, “The Lord is witness against you and His anointed is witness this day that you have found nothing in my hand” (1 Samuel 12:3-5). Have I said, ‘Give me something’, or ‘Offer a bribe for me from your wealth’? (Job 6:22). For the Lord your God is the God of gods and the Lord of lords, the great, the mighty, and the awesome God who does not show partiality, nor take a bribe (Deuteronomy 10:17). ‘Cursed is he who accepts a bribe to strike down an innocent person.’ And all the people shall say, ‘Amen’ (Deuteronomy 27:25). Woe to those who . . . justify the wicked for a bribe, and take away the rights of the ones who are in the right! (Isaiah 5:23). “In you they have taken bribes . . .” declares the Lord God. “Behold, then, I smite My hand at your dishonest gain which you have acquired and at the bloodshed which is strong among you. Can your heart endure, or can your hands be strong, in the days that I shall deal with you? I, the Lord, have spoken and shall act. And I shall scatter you among the nations, and I shall disperse you through the lands . . . (Ezekiel 22:12-15).
. . . though you have built houses of well hewn stone, yet you will not live in them; you have planted pleasant vineyards, yet you will not drink their wine. Because I know your transgressions are many and your sins are great, you who distress the righteous and accept bribes . . . (Amos 5:11-12). Her leaders pronounce judgment for a bribe . . . on account of you, Zion will be plowed as a field, Jerusalem will become a heap of ruins, and the mountain of the temple will become high places of a forest (Micah 3:11-12). O Lord, who may abide in Thy tent? Who may dwell on Thy holy hill? . . . [he who does not] take a bribe against the innocent. He who does these things will never be shaken (Psalm 15:1, 5).
. . . he who hates bribes will live (Proverbs 15:27). He who walks righteously, and speaks with sincerity, he who rejects unjust gain, and shakes his hands so that they hold no bribe . . . will dwell on the heights; his refuge will be the impregnable rock; his bread will be given him; his water will be sure (Isaiah 33:15-16).